Championship Division Winners Jeff and Amy Smith Linton who beat out an awesome fleet of sailors to finish at the top - well deserved! Challenger Division WInners Karen Jones and CHuck Tanner who won 6 out of 8 races and voluntarily retired from a race but still finished at the top of the fleet! Winner of the prestigious Allen Douglas Award for Spostmanship was Jim Moyle pictured here with FSSA President Bill Vogler and fellow Fleet 135 member Deb Aronson. Our wonderful Regatta Chairperson John Pether who worked tielessly to ensure everyone had a great time and no stone was left unturned! We are all so very proud of Jim Moyle for his willingness to help out a fellow Flying Scot sailing team. After driving many hours from Minnesota to sail in the Midwinters, he drove 3 hours in the opposite direction to pick up a stranded couple and their boat so they, too, could participate in the regatta! Note that Jim felt what he did was no big deal and anyone would have done it! But we are not so sure that just anyone would have done it and the fact is that HE is the one who did it - what a guy! And if you are wondereing where the rest of the photos are from this fabulous event, here are links to a few (hundred) more photos.Feel free to use the photos, but please give credit to the photographers if you choose to publidh them. 2019 Midwinters at Sarasota Sailing Squadron, FL - in the books! And we saved the best for last. Along with the sun shining and the temperature in the 80's, we had northerly winds 10 - 13 steady all day! The RC ran two great 4-leg windward leeward races and there was very little mark moving during the day. There was one postpone in the second race when the wind shifted a bit and we had to restart but everything else was just fabulous! After three great days of racing, the winners are: Championshiop - Jeff and Amy Smith Linton and Challenger - Karen Jones and Chuck Tanner. A big thanks to PRO Fairlie Brinkley and Regatta Chair John Pether and the entire Sarasota Sailing Squadron for a well-run regatta. It is always a great place to sail and always a fun time! Wow! PRO Fairlie Brinkley and his excellent Race Committee gave us 3 great races today so we have finished 6 of the 8 races scheduled. The day started out with a postpone for a little over 1/2 hour when the wind finally appeared. We started in 6-8 and worked our way up to 12 MPH over the 3 races. The forecast had been for little to no wind today so we were fortunate to get in 3 races! In the first race the wind was light and the Championship fleet was pretty tight. The Challenger Division was a bit more spread out with the fleet left and right. The second and third races we got a little more wind and the fleets were pretty spread out. While first place stayed the same in the Championship Division, the rest of the places changed for both fleets. Tops 3 in Championship are now (1) Jeff and Amy Smith Linton, (2) David Ames and P.Butler, and (3) John Aras and Jackson Benvenutti. Challenger leaders are (1) Karen Jones and Chuck Tanner, (2) BIll Vogler, Howard Harris and Carol Claypool and (3) Phil Scheetz and RIchard Baucom. A nice dinner is planned at the club tonight thanks to Regatta ChairJohn Pether and crew. We'll have 2 more races tomorrow so we are hoping for great conditions. 2019 Midwinters at Sarasota Sailing Squadron, FL - lots of boats coming! We have 58 teams from over 10 states registered for the Flying Scot Midwinters at Sarasota Sailing Squadron! With the temperatures in the 70's and the wind around 10 MPH, about 20 boats went out for some practice racing and a few others went out just to practice on their own. 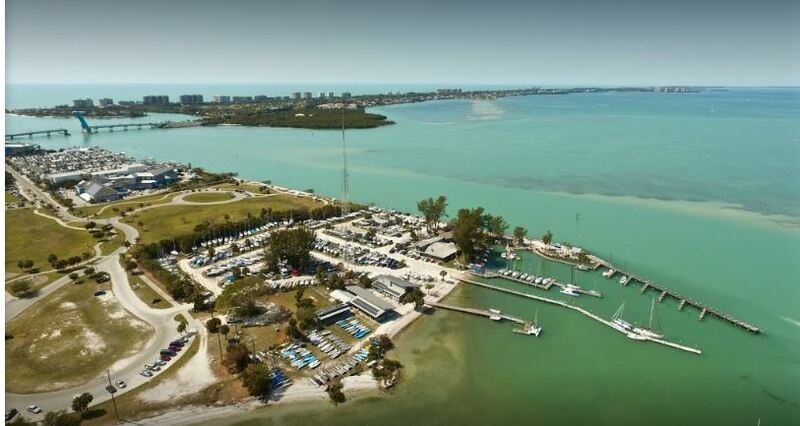 We're all looking forward to the rest of the week with racing the next 4 days on beautiful Sarasota Bay. Hope you are lucky enough to be here! Will Zeke and Jay Horowitz repeat? Stay tuned for the next several days to find out! Have You Registered for the 2019 Midwinters Yet? No Time Like the Present! It’s going to be another wonderful Flying Scot Midwinter Championships at the Sarasota Sailing Squadron. Save the dates – March 23-27, 2019. Great racing in a great place! Several memebrs have registered already so you should too! For more information, visit this page for links to registration, who;s coming and lots more! Sarasota is busy getting ready for us! Hope to see you there! Updated 02/09: It's not to late to sneak in a Midwinters Warm Up and attend the George Washington Birthday Regatta at Lake Eusits. More than 30 boats have pre registered and we're still a week away! To register and see who's coming, visit http://regattaregistration.com.